Jim Payne is a high achiever. He sets goals and he reaches them. His enthusiasm for all things aviation developed when he was a child in Hastings, MI and listened to his father's stories of World War II bomber flying. He resolved to make flying his life work and set his sights on attending the Air Force Academy. He was accepted to the class of 1974. It was at the Academy that Jim found soaring when, in his Freshman year, he was selected for the Academy's summer soaring program. He flew as often as he could and had 832 fights by the time he graduated. After graduation, he visited Benz Aviation in Ionia, MI and flew a 1-26. He went to Air Force flight school in Texas and was assigned to further training in fighter aircraft. Flying sailplanes had to take a back seat for a while as he developed his Air Force Career. He was assigned to Wright Patterson Air Force Base in 1987 where he earned a Master's Degree in Aeronautical Engineering at the Air Force Institute of Technology. Now he had the opportunity to return to the soaring he loved. He and his wife Jackie joined the Caesar Creek Glider Club where he became a tow pilot and instructor - as well as flying sailplanes again. He also was able to get started on his dream of racing sailplanes. He bought a 1-26E to compete in the 1-26 Nationals. His next assignment was the Test Pilot School at Edwards Air Force Base. On the way to his new assignment, he participated in another 1-26 competition and took home the winner's plaque. Now, in the spring of 1983, he was in an area where he could do some wave flying - a part of soaring that soon became his main goal. He also started collecting records. Additionally, he served his fellow pilots by being the Team Manager for five World Competitions. 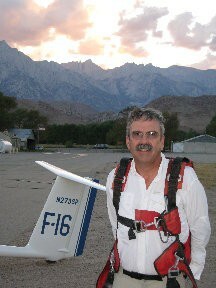 He bought a new sailplane in 1987 and, in 1988, attended the Air Force Command and Staff College in Alabama. While there he set some Alabama records. Then he spent four years at the Air Force Academy teaching aeronautics and helping with the soaring programs as well as continuing competition soaring. In 1992 he returned to what must really be his home - the Test Pilot School at Edwards - where he became Chief of Academics. He continued his competition soaring and joined with his brother Tom to buy an ASH 25 for contest and record flying. Jim retired from the Air Force in 1996. Now that his location was more predictable, he became an SSA Director for Region 12 and also served for a time as an SSA Vice President. He and Jackie built a home outside the Edwards gate at Rosamond Sky Park - now they had a runway right in front of their home. Jim accepted a position managing the flight test of Global Hawk. But still he and Tom had time to set records and fly competitions. 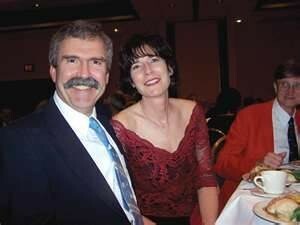 Jim (also known as JP or 'Jet Pilot') now had the opportunity for more soaring of his choice. Jim's passion is soaring long distances and flying fast - the challenge of doing better, going farther, going faster and enjoying the beauty of the terrain. Much of his outlet is now the OLC competition where he has been world champion several times. 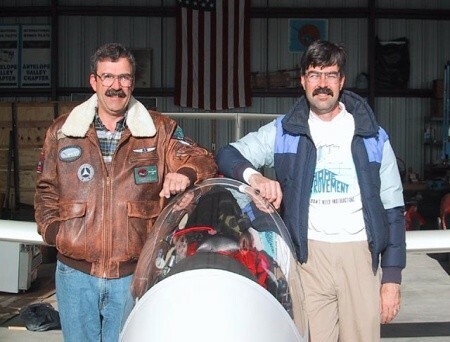 Jim and John Murray (with others) sponsored the cross-country series of goal flights flight to honor the 100th anniversary of the Wright Brothers first flight. 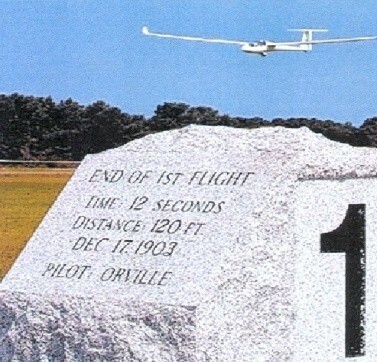 On July 4, 2003 the sailplanes landed at Kitty Hawk on the grass beside the landing site the Wright Brothers used - the first time since the 1930s that landings had been allowed in this location. Jim holds Silver #2520 (1973), Gold #1484 (1983), Diamond #561 (Intl #3598, 1984), 1000K Diploma #74 (1976), 750K Diploma #16 (2009), Symons Lennie Pins - one #1119, two #98, three #23; SSA Distance Award (1996), with Tom (1995), World Distance Award. He was World Team Manager in 1987, 1989, 1991, 1993, 1995. He also was awarded the FAI highest gliding award -- Lilienthal Medal (2001) and SSA most prestigious Trophy - the Eaton (with others, 2003). In addition, he has many other awards for service and competition. Jim is now the Chief Pilot for Perlan. With the Air Bus funding, the future is bright. Perlan 2, the sailplane designed to fly to 90,000 feet, had a successful first flight in the fall of 2015 and, at this writing, is being prepared for flights in Argentina. Thus, an even brighter future is likely ahead for the enthusiastic young lad from Hastings who decided to dedicate his life to aviation.